Missouri and Illinois clients in the St,. Louis, St. Charles, St. Clair, Madison and Edwardsville areas have experienced the experience of the Law Office of Kenneth Carp and so can you. Workers who are separated from employment are still entitled to the same workers’ compensation benefits under the state workers’ compensation laws just like a worker who is still employed. Even if the separation from work was due to misconduct or a quit, even if unemployment was denied a worker can still claim benefits. If you or a worker was injured or have a work related illness like carpal tunnel that you want to discuss during a free consultation call and speak with one of our Missouri or Illinois attorneys? Contact us at (636) 947-3600 and we’ll give you the information you need to make an intelligent decision. Our lawyers know if a workers’ compensation claim for a work related injury or illness can be made after you quit or have been fired. Workers compensation was designed to protect workers and provide benefits to workers injured while on the job performing tasks for the employer. Missouri and Illinois Law dictates that workers can not be fired for the filing of a workers’ compensation claim. Contact us for a free consultation about worker related injuries or diseases. Our lawyers have been representing individuals for over forty years and know the system and how to make it work for you. Our attorneys understand the injuries and how they impact your life. 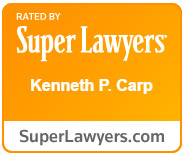 At Law Office of Kenneth P. Carp our senior attorney has more than twenty years of experience with workers’ compensation. You may call and speak with him directly to discuss your workers’ compensation question. Our attorneys will know you by name and work for you. Call us at (636) 947-3600. You may also e-mail us for an immediate response.